INTRODUCTION: Outpatient endoscopy is a standard procedure with one million procedures done every year. Approximately 320$ are lost for every days work lost both to the employer and the employee. Total 320 million dollars being lost every year. Six hours fasting for solids and two hours for liquids are standard anesthesia guidelines prior to sedation. This study evaluates the beneficial effects of Orally Disintegrated Metoclopramide(ODM), a pro-motility agent, given 20 minutes prior to the procedure in the late afternoon with five hours post lunch interval. METHODS: 517 patients (age: 25-75 years) were randomized into three arms. Arm A (n=172): ODM 10 mg, 20 minutes before endoscopy in the late afternoon; Arm B (n=172): oral Metoclopramide 10 mg, 30 minutes before endoscopy; Arm C (N=173): the placebo. The last solid meal was given at noon (one oz. of either chicken, turkey, or tuna with half an oz. of potato or fruits salads, without mayonnaise or dairy products, and 12 oz. of water) five hours before endoscopy. The Anesthesiologist administered routine IV Propofol with documented pre- and post-sedation time. The total time of pan endoscopy with six biopsies and recovery time were evaluated. Exclusions: active GI bleeding, DM, BMI>33, neuromuscular diseases, known gastric motility disorders, gastric malignancy, and drugs altering GI motility. RESULTS: The total sedation time was similar (p=0.91) between the ODM (5.1±0.9 minutes; mean±SD) and oral Metoclopramide (5.6±1.4 minutes) groups; both groups were significantly shorter (p<0.001) than the placebo (12.6±3.4 minutes; p<0.001, one-way ANOVA). Likewise, the recovery time was comparable(p=0.75) between the ODM (11.7±4.3 minutes) and oral Metoclopramide (10.9±4.4 minutes) groups, with both being significantly shorter (p<0.001) than the placebo (27.9±6.5 minutes; p<0.001, one-way ANOVA). No major side effects were observed in the ODM group, while dizziness and confusion occurred in both the oral Metoclopramide (n=11 and 7) and placebo (n=20 and 12) groups. 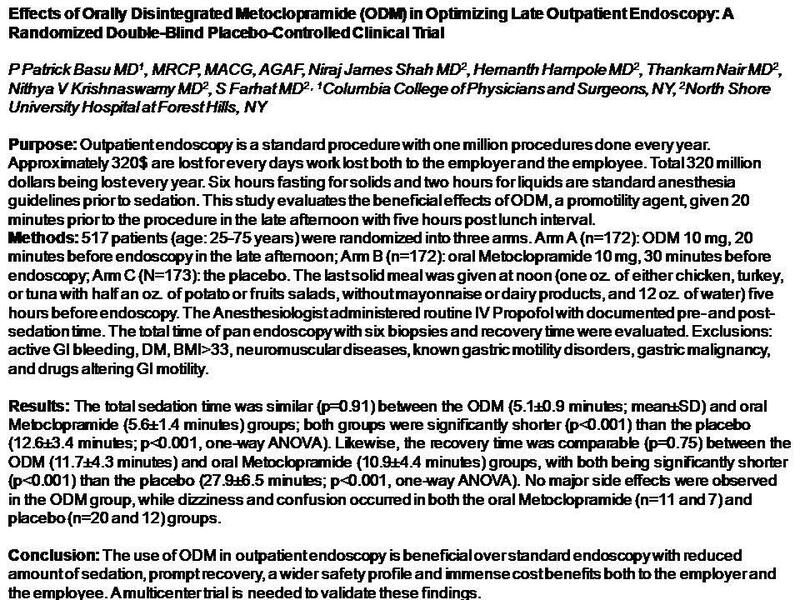 CONCLUSIONS: The use of ODM in outpatient endoscopy is beneficial over standard endoscopy with reduced amount of sedation, prompt recovery, a wider safety profile and immense cost benefits both to the employer and the employee. A multicenter trial is needed to validate these findings.